Here’s a Jif Coupon available to Print. 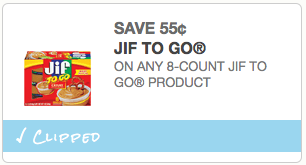 Print and Save $1.25 Off 2 JIF To Go Peanut Butter Printable Coupon! Print and Save $1.25 On any 2 Jif Peanut Butter products Coupon! 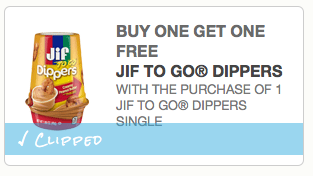 Print BOGO FREE JIF TO GO DIPPERS SINGLE Coupon! Print and Save $1.00 off ANY Jif Hazelnut Spread Coupon! Here’s a Jif To Go Coupon available to print. 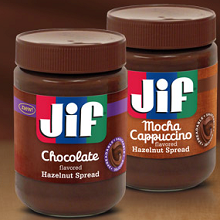 Print and Save $1.00 OFf 1 JIF To Go Printable Coupon!